Remember that old saying, “If Mama ain’t happy, ain’t nobody happy?” As our former neighbor Steve used to say, fuhgeddaboudit. Mamas might be the emotional bellwether of the home, but we’re also the nurturers, the fixers, the I’ll-make-it-better people. And therein lies the problem. If one of my children/family members/coworkers/friends/parishioners is not happy, I can’t be either. Or so I think. Because I hurt for them. I’m not at peace if things are going well for me but not for them. Injustice aside, there must be something I can do, right? Take away the pain, bring back the child, find them a job, fix the marriage, kick the abuser in the kneecaps? Not. My. Job. But that doesn’t stop me from applying anyway. So I’m watching carefully these days to see how others offer compassion. And recently the person tutoring me in being a comforter is precisely the one who has 60 fewer years on the planet than I do. Funny, that. Our four-year-old granddaughter, Libby, doesn’t read yet. She can’t send cards or make meals or donate money. But what she can offer is herself. When my beloved father-in-law died unexpectedly last New Year’s Eve, we were visiting Libby’s family in Hungary. When Mike clicked End on the call that broke the news, his face crumpled as he wept. Watching quietly, Libby leaned in close, stroking his face. “I’m so sorry about your dada, Baba,” she said simply. She didn’t try to minimize the pain (“At least you had him so long,”) or lessen our loss (“Well, Poppa’s in heaven so that’s OK.”) By simply offering the solace of her presence, she taught me to let tenderness be enough. At Rowe Family Camp this summer, Libby and her cousin Willow were scrambling out of their family’s minivans when they noticed Mike’s mom standing alone at the top of the park stairs without her lifelong companion at her side. 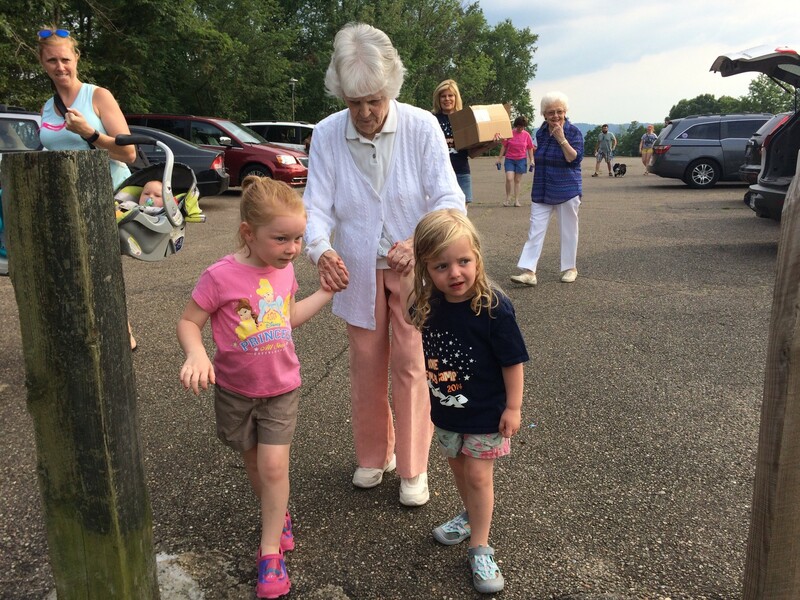 The two little girls ran over and took their great-grandmother’s hands, gently guiding her to the picnic shelter. They didn’t allow their diminutive size to stop them from helping. Libby is teaching me to do what I can, and not to let size or ability hold me back. My nearly 93-year-old mom, whom Libby calls “Super” for Super (great) Grandma, took a bad spill recently that has left her fractured kneecap immobilized in a painful brace. From thousands of miles away on video chat, Libby gazed at her great-grandmother intently, her small face wrinkling in concern. “What’s she doing?” we asked our daughter, who responded with suppressed laughter. And sure enough, Libby returned a moment later holding out a favorite little red purse. “Here, this is for you, Super!” she said decisively. From Libby I am learning to give what you have. A stroked cheek. A proffered hand. A favorite possession. Small things, really. But small things given with great love. When others are distressed, we can watch and listen attentively for visual or verbal cues of ways we can help. Let tenderness be your guide, don’t let your limitations hold you back, and simply give what you have. That’s what I’m learning from Libby. 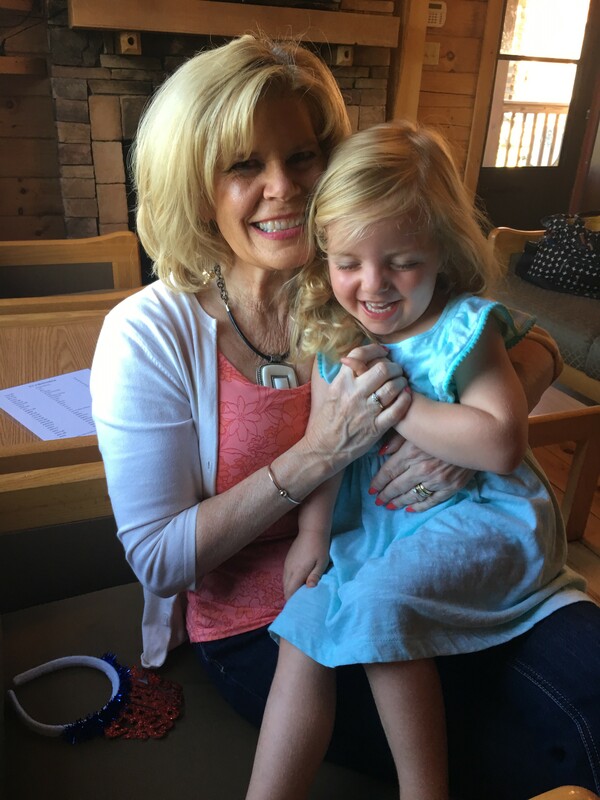 Precious – thank you for sharing your granddaughter with us, Maggie! She knows how to soothe the wounded and you know how best to express it. Thank you. Such sweetness! I hope I never miss it in the all the whirl of the day to day. So beautiful. Such a soft and loving heart she has.